Suzuki might still be best known for motorbikes in the UK but it is keen to build on the success of the Swift and develop the car brand further, with a rapidly developing line up now spanning five models. The Celerio is the smallest and enters an increasingly competitive city car sector. The first thing that we need to address is the styling, or rather the lack of style. Both the interior and the exterior take a purely functional approach to their form which may be a problem for Suzuki dealerships as there are a number of stylish alternatives from the likes of VW, Renault, smart and Fiat which offer more kerb appeal. However if you can look past the underwhelming first impression there are some neat design touches. Firstly the high roof line means that there is sufficient headroom in the back for adults, and thanks to the standard 5-door configuration they also have a fair chance of getting to the back seat without having to visit a chiropractor. Day-to-day usability is further boosted by a class-leading 254 litres of boot space. The no-nonsense engineering continues under the bonnet, where you will find a 1-litre 3-cylinder engine. Rather than using turbocharging, Suzuki’s engineers have added a second fuel injector into each cylinder which is claimed to produce a finer mist of petrol which burns more efficiently. With the addition of stop/start, a water-cooled EGR system, a redesigned piston, and a higher compression ratio, claimed fuel consumption is around 20% better than the none Dualjet engine. The Celerio lacks the looks of class leaders but it offers a keen list price, decent kit, bags of space and an excellent official fuel economy. 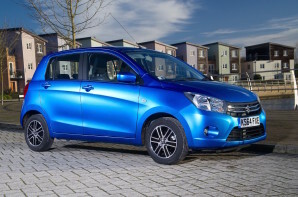 It’s a shame that more of the style present in the Swift hasn’t filtered down, but if you want an affordable, efficient and practical small car the Celerio ticks several boxes.